you need for a short trip. Most airlines now charge for a checked bag, so passengers cram as much as possible into their wheeled carry-ons. And (bummer) a few airlines have begun charging for bags you bring onboard the plane. The most typical fee for a checked bag for U.S. airlines is $25 each way or $50 for a round-trip flight, but you can often avoid that by traveling with carry-ons only. These packing tips can help you fit up to a week’s worth of clothes and necessary items into the maximum-size carry-on, which is 22 x 14 x 9 inches (Even so, you might be required to gate check your bag on smaller planes). 1. Make a list of what you’ll need—then follow it. You can have a general list that covers any travel; then add specific items needed for the current trip. 2. 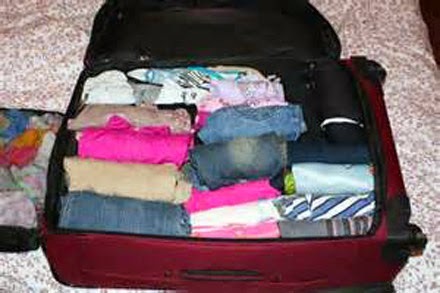 Before starting to fill your suitcase, set aside the clothing items you plan to take—then put at least a third of those items back. Same with jewelry and personal care items. Do you really need three gold necklaces and four lipsticks? Most hotels supply shampoo, conditioner, and body lotion, so you can leave yours at home. Choose a soft side bag with wheels. 3. A soft-side bag will stretch to accommodate over-stuffing, unlike hard-shell luggage. Wheels are necessary—no longer a luxury--as are strong zippers and reinforced corners. Stash travel documents or other items you might need on arrival in outside pockets. 4. Packing pros recommend rolling rather than folding clothes. 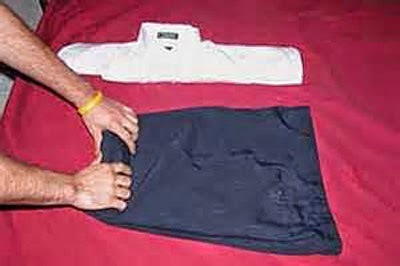 Shirts, pants, and skirts take up less space and wrinkle less when rolled. Or purchase bags specially made for vacuum packing these items. Rolled clothes take up less space and wrinkle less. 5. Stuff small items like socks and underwear (and chargers) into shoes or other odd-shaped items. After your main wardrobe is packed, slip these small items into the nooks and crannies. Mesh bags of various sizes can help keep socks, sleepwear, and T-shirts organized. 6. When traveling to a cold destination, wear jacket, boots, and scarf on the plane. These items take up too much space in a suitcase, and chances are you can stash them in an overhead bin if they’re too bulky at your seat. That coat might even make a good pillow if you want to sleep. 7. You’re allowed to carry on a personal item, so make sure it counts. 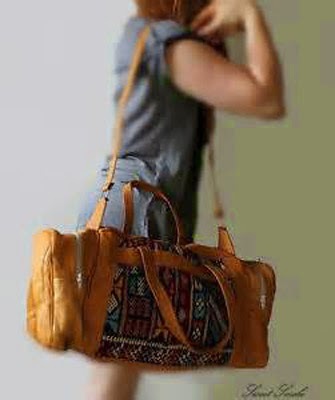 A large shoulder, duffel, or tote bag can hold a week-end's worth of clothes and a computer thus increasing your packable space. Just be sure it will fit under the seat or in the overhead bin of smaller planes for take-off and landing. 8. Packing liquids can be a problem when you’re not checking a bag. You can’t take a jar of barbeque sauce to your friends or sneak in a bottle of wine purchased on your trip. The TSA limits liquids to 3.4 ounces or less per container, and all of these together must fit into a quart-size plastic zip bag. That’s a tall order for women who typically have a variety of personal care and cosmetic items. Instead of packing liquid perfume, deodorant, sunscreen, insect repellent, make-up remover, etc., switch to solids and wipes. Many hygiene products now are designed in sizes and composition that meet the regulations of air travel. 9. Realize that you don't need a different outfit for each day of travel (will you ever see these people again?). A pair of all-purpose shoes (sandals or ballet flats can work for day or night) saves a lot of space. 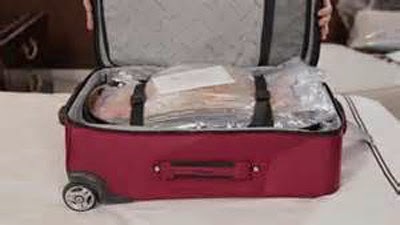 Bonus--lighter luggage is easier on your back and shoulders if you need to lift it into overhead bins, and it's more maneuverable in tight spaces like the aisle of an airplane. All photos from free sites. Good tips. Also, when possible, ship a carton(s) ahead to your destination. Be certain to insure the contents. I always pack a portable steam iron to make certain my clothing isn't wrinkled. I also keep a list of every item I've packed in case the suitcase is lost or delayed.